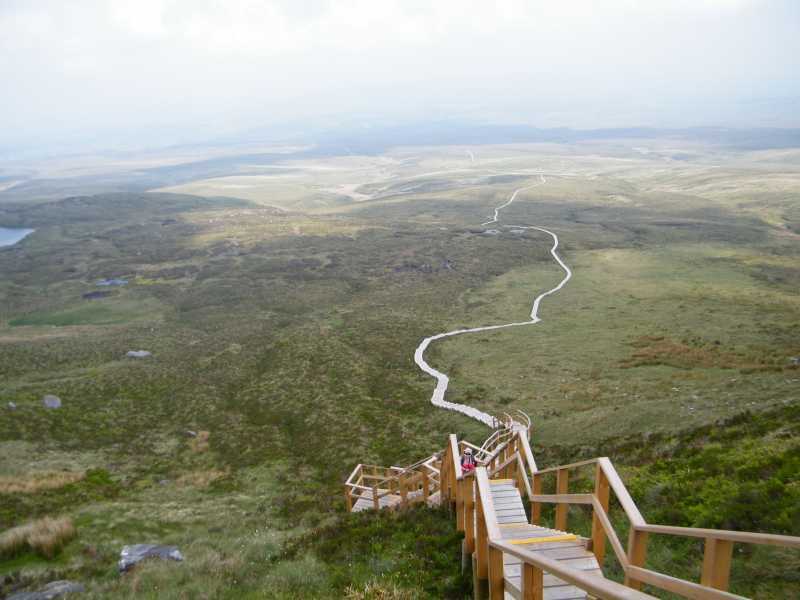 Cuilcagh is the only county top to straddle Northern Ireland and the Republic of Ireland and, lying on the boundary between counties Fermanagh and Cavan, is also part of the world’s first international Geopark: the Marble Arch Caves Global Geopark (2008). 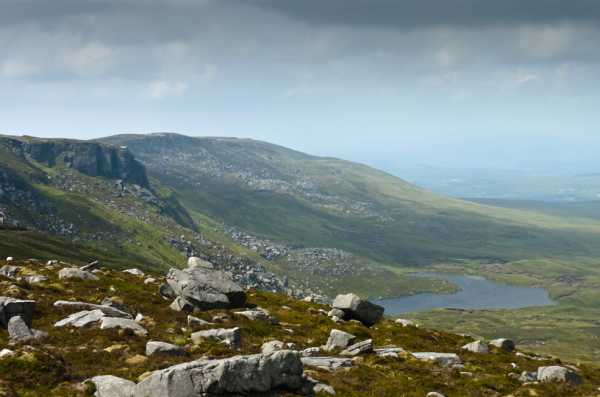 Cuilcagh’s distinctive table top plateau is comprised of gritstone, uncommon in Ireland, eroded into dramatic cliffs and rugged rocky outcrops that sweep down to lower sandstone and shale slopes which tail off into large expanses of upland blanket bog. Below this is limestone, with its mysterious sinkholes and extensive cave systems. In view of the turbulent past of this area, the Geopark is a fine example of cross border co-operation and peaceful coexistence using the landscape as a vehicle for recreation, education and reconciliation. The day held little promise, with rain in the air, oppressive with humidity and the pungent smell of turf, as we set off up a track at H13385 24714 A towards Benbeg. Three figures moved steadily out on the bog, hurriedly loading bags of peat into a tractor trailer, as we left the track for steep ground skirting the edge of forestry. Thick mats of sphagnum moss entangled with heather and bilberry made the going tough. 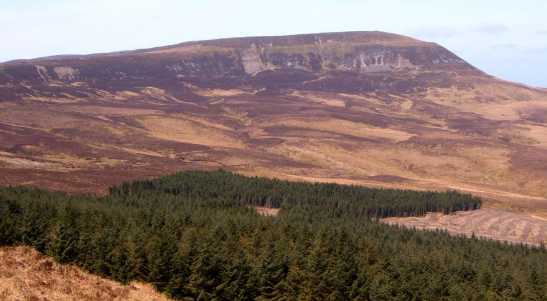 Above the forestry we traversed the edge of a corrie with steep shaly slopes of honey coloured rock beneath Benbeg. The summit is unremarkable with no cairn, but the views compensate, especially the long sweeping ridge we were to cross, with Cuilcagh at the end, moody and shrouded in cloud. Gaining the ridge involved traversing undulating boggy ground, picking a way through a maze of eroded peat hags, then a short scramble over gritstone outcrops. On the ridge the sun broke through the cloud with almost supernatural radiance, illuminating Cuilcagh’s trig point that protruded from its distinctive mound, resembling the breast of a slumbering mountain goddess. The wind driven mist billowed like smoke up over the sheer cliff edge. The rocky summit plateau is a delight. Outcrops of gritstone are weathered into intricate patterns, some slabs of it encrusted with quartz pebbles from an ancient deluge. Strange crevices, 20 ft deep that disappear, choked with glacial debris, before reappearing, harbour huge ferns. The cloud had now lifted, offering fine views of cornflower blue Lough Atona nestled at the foot of craggy cliffs set amid the russet and green of bog and heather. Towards the NE were small hills, ancient limestone reef knolls, and near pristine blanket bog with pools of water that sparkled merrily in the feeble sunlight. Climbed 5.6.04 starting at Cuilagh Mountain Park near to Marble Arch Caves (121336 D). There is a large sink hole here but very difficult to see down into due to vegetation. Cross stile and follow track. Just after crossing bridge take "floating path" off to right, this soon ends but continue in westerly direction to pick up course of Sruh Croppa River after half hour. Follow winding course of river through gully with nice waterfall and past some ruined settlements. As near summit of Tiltinbane (596m) climb away from river to the right to avoid steep gullies. Follow fenceline up to the summit - the final section is quite steep and may require use of hands. A depression next to summit cairn is perfect shelter for a brew. There are extensive views from the summit ridge - north and west towards Sligo Bay and big hills which i think were the Nephin Beg Mountains in Mayo and south over Iron Mountains. Follow path which keeps close to northern cliffs, passing fissures in rock and Lough Atona ,reaching large summit cairn after 1.5 hour walk along summit. Had intended to return by Ulster Way between Trien and Benaughlin (marker posts just visible) but shortened journey by heading north over moor following river courses back to the track at the bridge. A long walk at 6.5 hours but rewarding with plenty of interest and some good views.